Is New Orleans the New Hot Spot For Foodies? New Orleans is definitely a city that knows how to reinvent itself. Throughout its 300 year history, NOLA has been known for just about everything from jazz to voodooism to Mardi Gras. Even after Hurricane Katrina left New Orleans practically underwater back in the summer of 2005, its resilient community came together to help reinvent her once again. Since then, tourism has been back on the up for this southeastern Louisiana city, with the New Orleans Tourism Marketing Corporation predicting 2016 to be a banner year with tourism spending projected at $7.1 billion. That’s more than 2015, which was already a record-breaking year for the industry. And it doesn’t stop there. It appears New Orleans is also in the midst of a culinary renaissance. According to Eater, there’s been 20 new restaurant openings in New Orleans since September alone, with at least 20 others that celebrated openings during the summer. From the long-awaited grilled cheese spot Melt in Mid City to the casual new tavern and art gallery, Artisan Bar & Cafe (located on St Claude Ave), there are new restaurants to please every price point, palate and overall vibe. What started as an attempt to bring Cajun Country inspired plates to New Orleans has grown into thriving sandwich shop, butcher shop, and wine bar Cochon Butcher. The idea to take an old-world, meat-market-esque concept into the fast casual sphere expanded from its owners', Donald Link and Stephen Stryjewski, traditional, Cajun Southern establishment, Cochon Restaurant. The more casual Butcher breaks down pigs for the main Cochon Restaurant, but don’t let that fool you into thinking it lies in the shadow of its elevated dining brother. In seven years, Cochon Butcher has gone on to receive recognition in its own right as a heightened fast-casual spot. Due to its unique structure, running as a butcher shop, a sandwich shop, and a wine bar all in one, it caters to customers of all types. Its atmosphere varies from bustling sandwich and soda shop around lunch, to a delightful bistro-like setting in the evening. Their menu offers traditional sandwiches, like the Barbecue Pork served Carolina style, as well as elevated housemade pastas paying homage to Italian salumi and charcuterie. The Butcher specializes in housemade cured meats, terrines, and sausages available by the pound. In this episode of “Fast Casual Nation,” brought to you by the Foodable WebTV Network, we visit Cochon Butcher where Chef de Cuisine Hank Shackelford assembles a menu with Cajun Country and Creole influences. Host Paul Barron stops in to discuss the diverse menu and how it’s been received by New Orleans. In New Orleans, there is a concoction that has stood the test of time. It is said to be the first-ever American cocktail — although no one can say for sure where the word “cocktail” derived from with certainty or historical proof, for that matter. It is called the Sazerac. This drink is actually the official cocktail of the Crescent City since 2008, after the Louisiana House of Representatives made a historic decision in a 62-33 vote to declare the Sazerac Cocktail the New Orleans’ official drink of choice. 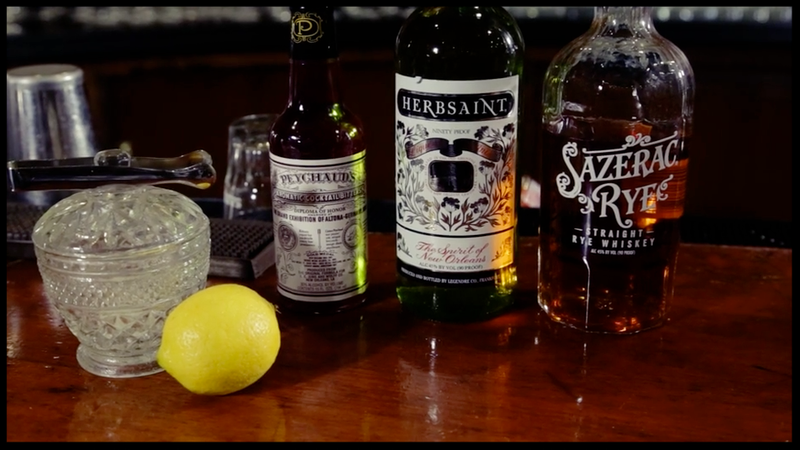 In this episode of “Across the Bar,” host Paul Barron set out to learn the history about the evolution of ingredients behind this famous drink from some of New Orleans’ best cocktail historians: Elizabeth Pearce, Kevin Richards, and Russ Bergeron. And what better place to go on this historical journey than at the The Sazerac Bar inside The Roosevelt Hotel? The origins of this drink date back to the 1830s and each ingredient for the cocktail is very much representative of New Orleans, and even the state of Louisiana. “If you pick apart the ingredients and start to think about how they are tied so locally; so, you got the Herbsaint created by a New Orleans pharmacist [Marion Legendre], you got sugar, which is such an agricultural stand-by here in the state of Louisiana, you got the lemon and the lemon influence from Sicilians that descended upon New Orleans in mass and created these great cultural legacies…” said Richards. And of course, we can't forget to mention Peychaud’s bitters, made by the local apothecary of the time, Antoine Amedie Peychaud, and from his family’s secret recipe. 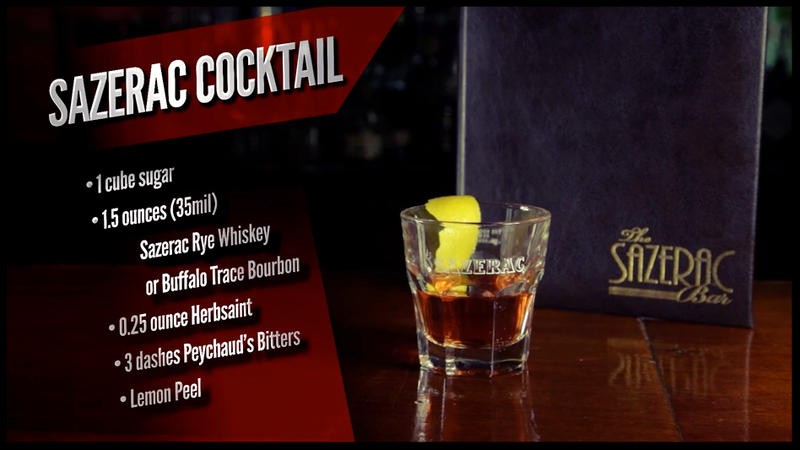 With such deep roots in America’s Most Interesting City, it is easy to see why the Sazerac calls New Orleans its home. We also had the opportunity to learn about the Ramos’ Original Gin Fizz, a refreshing summer cocktail created by Henry Charles Ramos back in 1888 while he worked at the Imperial Cabinet Saloon. This cocktail is also referred as the New Orleans’ Fizz, and at some point, they were selling up to 1,000 a day. The drink was an instant hit and its success allowed Ramos to open his own bar. From the 1890s all the way up until the National Prohibition Act was implemented, the only challenger to Ramos’ Bar was the Sazerac Bar (at the time still in the French Quarter). When Prohibition went into effect, Ramos closed shop for good. The recipe for the popular concoction was shared to a local reporter by the Gin Fizz creator himself, after Ramos agreed to be interviewed in vigorous belief that prohibition was never going to be repealed and as his health was in decline. The recipe is readily available to everyone now, but after the ban was lifted, Ramos’ son sold the rights of the recipe to Seymour Weis, the owner of The Roosevelt Hotel. Watch the episode to learn more! Tales of the Cocktail is committed to the growth of the cocktail industry through providing a week of seminars, tastings, networking events, and more, and is specifically designed for bartenders, mixologists, distillers, and other spirits professionals around the globe. This annual meeting place to share new techniques, products, and ideas seems like a huge endeavor — but how did it first stir up? In this episode of "On Foodable Weekly," we get the inside sip with co-founders Ann and Paul Tuennerman. The concept began in 2002, but was originally a walking tour where a small gathering of cocktail lovers explored bars and restaurants across New Orleans. "So, I started this walking tour to tell the story of all the famous drinks invented in New Orleans, all the famous spirits invented here...to take people behind the scenes who really didn't know or understand this information," Ann said. In the days before Facebook and other social media platforms, Ann had to hit the phones and pavement. During its first year, she managed to got 10 top mixologists to share their insights and it has only evolved since then. "There hasn't been a meeting place for folks from around the world — the most influential of the industry — to gather and share...best practices and what's on the forefront, and learn from one another, and really just get energized and continue that rolling innovation that's taking place now," Paul said. But more than the seminars and exchange of knowledge, attendees are able to celebrate personal connections and find other professionals with the same passion, whether they are from Ghana, New Zealand, or in the United States. It's all about connecting, not networking. And this premier cocktail festival "makes it okay to be a bartender again," where like when a person says he or she is a chef, there is no follow-up question of "What else do you do?" There are other events Tales of a Cocktail hosts each year — about 200 of them. There are walking tours in other cities and a membership program, but the most important element is education. "I think now our philosophy is as long as we're providing education, it really doesn't matter what form it's in," Ann said. In this episode of “Across the Bar,” Foodable travels to the corner of Canal and Bourbon street to visit French 75. Perhaps one wouldn't expect a 1920s French-themed bar to do so well in modern-day times, but this classic concept is more than just a New Orleans icon. Arnaud's French Bar 75 has been named a James Beard finalist in the "Outstanding Bar Program" category for two years in a row, and head bartender Chris Hannah was even nominated for the 2016 Tales of the Cocktail "Bartender of the Year." "Remember that you're taking care of guests. It's always hospitality," Hannah said when asked what makes a great bartender. "They have to come back in order to keep buying drinks, so [you have to make sure] they leave wanting to come back to the bar." French 75 was named after Arnaud's favorite World War I era cocktail, the French 75. The drink itself was named after the first cannon with a recoiling system, one that was able to shoot faster — a fitting name for a cocktail that packs a punch. It's no surprise this is the bar's most popular order. Hannah says they make it more than anywhere else in the world at just over 500 of those bad boys a week. The Night Tripper, named after a famous New Orleans pianist, is one of Hannah's favorite drinks. Its mix of local bitters and bourbon make it not too sweet, but it still holds the power of a classic cocktail. For the last drink in the lineup, "Across the Bar" show host Paul Barron got a chance to go behind the bar and mix it up for the head bartender himself. No pressure making a drink for the guy who created it, right? "Look at that Miami flair. I'm diggin' it," Hannah laughed as he watched on. "I'm really glad you're doing this good of a job. You know, there's this festival in town. I want to go see some of my friends. ...Here's my jacket. I'm off!" Watch the full episode now!